Greetings, sales charts fans! It's time once again to look at DC's sales figures. A coupe of DC’s new initiatives began in September, with the first of their Black Label books making a splash (just perhaps not in the may they wanted...) and the latest effort to reinvigorate Vertigo. Add in the start of a grim-dark murdery Crisis and its the kinda-new, kinda-different DC. Warning: The commentary below may contain reasoned analysis, speculation (unfounded and otherwise), opinion, and/or snark. Those looking for a more straightforward analysis are directed to John Jackson Miller's excellent Comichron analysis, posted earlier this month over at Comichron! Please consider the fine print at the end of the column, as it explains several things about how these charts are compiled. 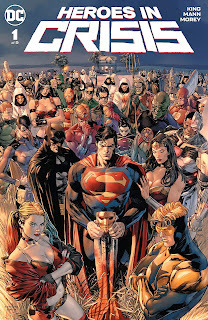 We also commend to you our analysis of cumulative DC Rebirth trade collection sales. DC’s latest exercise in grim-murdery crossover looks like it won’t be the runaway best-seller that Metal was, though it likely won’t be a flop either. It obviously needs more giant-mecha JLA and less super-hero slaughter. Doomsday Clock continues to march on at its bi-monthly pace (though if it had kept to its original schedule, DC would be prepping a hardcover collection for this year’s holiday sales...) At $5 a pop, it ranks above Heroes in Crisis on the dollar sales chart. Tony Daniel hops on board as artist for issue #55, as do over 10,000 Tony Daniel fans. We already know forth past that Tony Daniel + Batman = sales, so this should come as no surprise, and a reminder that putting a big name artist on your top characters is a still a recipe for success. You may have heard that there was little something extra on display here? Retailers ordered heavy on the debut comic in DC’s Black Label line of “adult” takes on the DCU—enough to make it the #2 dollar book for September—though they didn’t know in advance just how “adult” it was going to be... Despite overwhelming demand, DC have decided to not reprint this issue—even a censored version—because apparently they don’t like money. And which will have the added effect of suppressing sales on future issues in the series. Looks like it is already settling in at the mid-70K range, which would make for a win. A typical third issue drop, and we’re still seeing reorders for the first issue, so while perhaps not as high as DC had been hoping for, there’s also not much likelihood of the bottom falling out either. The best-selling 1003rd issue ever in the Diamond era! A typical third issue drop. Price increase to $3.99, but you’d hardly know by looking at the sales. Start of a story arc by James Robinson & Stephen Segovia. A less-than-typical third issue drop, which is a good sign, as are the reorders for the first two issues. And next month is a crossover with Wonder Woman, which will likely help to keep things up as well. Whoops, a bit of a drop there, as the publication delays may be having an effect after all. The first of the regular series in the Sandman Universe Vertigo sub-line, and it debuts way better than any Vertigo series has in quite a while. Not too surprising that this one would be the best-selling, as it is the one most closely related to Sandman. Also, Bilquis Evely rules. The end of Steve Orlando’s arc. Next month is the crossover with Justice League Dark, followed by G. Willow Wilson coming on board in November. Part four of a crossover with Suicide Squad. And next month starts the “Drowned Earth” crossover with Justice League, so Aquaman is going to ride that crossover wave through to his movie is released! The over-sized and -priced 50th issue had just enough of a boost to just push HQ back up over the 30K line. Sales this month rebound a bit, so maybe readers are liking the new direction? For some reason, Titans has moved to twice-monthly... The market welcomed this news by giving Titans its two lowest-selling issues in this series, despite (or perhaps because) of issue #25 being an over-sized and -priced anniversary issue. The second Sandman Universe title comes in a bit lower than The Dreaming, but it had the handicap of not being a revival of a previously-known series and not featuring any recognizable characters. But still, 28K is a remarkably good debut for a Vertigo series as of late. David Mack joins Bendis for Cover, which debuts between the first issues of last month’s Pearl and Scarlett. Part three of a crossover with Aquaman. A typical second issue drop brings sales right back down to where they were before the re-launch. First part of a new direction as a Red Hood solo title (although the title doesn’t officially change until next issue). Ending with issue #57 in October, to pave the way for Morrison & Sharpe’s The Green Lantern. It’s Supergirl & Krypto having adventures in space! Drawn by Kevin Maguire! With Amanda Conner doing awesome variant covers! Why aren’t you buying this?! What more could you want out of a comic?! I repeat: SUPERGIRL AND KRYPTO HAVING ADVENTURES IN SPACE!!!!!!!!!!!!!! The best-selling book in the rapidly deteriorating New Age of Heroes line. But even here the percentage drops are worryingly high at this point of the game. The lowest sales on an issue of Green Arrow since the New 52 era. Actually debuts a handful of copies higher than the original Icon series did back in 2014. Whoops, not settling in after all. That’s a hefty second issue drop, but there was a variant cover for the first issue and not one for the second. Regardless, all involved are happy enough with the sales here that Pearl has been upgraded to an ongoing. The first issue in the latest attempt to reinvigorate Vertigo, and it does okay, a good 50% better than other recent (non-Sandman-related) Vertigo series have debuted at. And there were some good reviews and a second printing on the way, so this may not be the sales debacle of the likes that have plagued Vertigo in recent years. Vertigo plan on releasing one new series every month for the next several months, so we’ll know soon if they’ve overplayed their hand. Another fairly large second issue Jinxworld drop, but like Pearl there is no variant cover of the second issue. Still dropping like a stone. Coming in at #164 on the chart is the $1 Jinxworld Sampler with 12,006 copies sold to retailers. As a promotionally-priced sampler it won’t be included in the summary charts below, but we’re including here for completeness’ sake. An Annual has been solicited for January. What exactly is being smoked over there at DC? Ending with issue #8 in January. Ending in October, though with a wrap-up Annual in November. No, not going to monthly, just switching from even to odd months. Teaming up with various DC monkeys and gorillas, so really this should have sold a lot more copies. 09/2008: Looney Tunes #166 -- ????? DC’s lowest-selling title for September, though we will note that Looney Tunes has been on an increasing sales trajectory all year! Vertigo average (3 comics): 26,954; Jinxworld average (4 comics): 19,110. Sales rebounded some for DC in September as they sold more copies vs. August despite having seven fewer titles for sale. The lack of low-selling Young Animal books and New Age Annuals definitely helped from an average sales perspective. Don’t be too concerned with the five-year percentage comparisons, as September 2013 was DC’s first lenticular cover stunt month. The Sales Index number is the ratio of that comic’s sales to the average sales of all comics in that category. DCU: Average: 40,021. Median: 28,843. No. : 49. Total: 1,961,045. Vertigo & Jinxworld: Average: 22,472. Median: 18,530. No. : 7. Total: 157,301. Digital First & Other: Average: 9,436. Median: 9,469. No. : 7. Total: 66,052. 0.9 - Teen Titans Go! The numbers above are estimates for comic-book sales in the North American direct market, as calculated by ICv2.com and Comichron, according to the chart and index information provided by Diamond Comic Distributors. ICv2.com's and Comichron’s estimates are somewhat lower than the actual numbers, but they are consistent from month to month, so the trends they show are fairly accurate. Since it's a "month-to-month" column, the comments, unless otherwise noted, are on the most recent month. Bear in mind that the figures measure sales of physical comics to retailers, not customers. Also, these numbers do not include many sales to bookstores, newsstands, libraries, other mass-market retail chains, or the United Kingdom. Re-orders are included, so long as they either reached stores in a book's initial calendar month of release or were strong enough to make the chart again in a subsequent month; or they show up in the year-end Top 1000. Keep in mind that sales for some titles may include incentives to acquire variants and not every unit sold is necessarily even intended to be sold to a customer. If additional copies of an issue did appear on the chart after a book's initial calendar month of release, you can see the total number of copies sold in brackets behind those issues (e.g. "[36,599]"). Likewise, any lower numbers due to returns or other factors returns will also be reflected in the brackets. Should more than one issue have shipped in a month which is relevant for one of the long-term comparisons, the average between them will be used. Titles which are returnable have their numbers artificially adjusted down by Diamond. To make up for that this column increases the reported numbers for those titles by 10%. Which is likely also wrong, but it's a different and likely less wrong kind of wrong, and experience has shown that this leads to sales figures which are more consistent. Titles released under the All-Ages line and magazines, such as Mad, mostly sell through channels other than the direct market, so direct-market sales don't tell us much about their performance. Likewise, Digital First comics are published online before print, and may do a significant amount of their sales in that arena. For most Vertigo titles, collection sales tend to be a significant factor, so the numbers for those books should be taken with a grain of salt as well. Please keep in mind that raw sales numbers do not tell us about how profitable a book is for a publisher or for the creators. Above all, do not allow sales numbers to dictate your purchasing and enjoyment of a particular comic. If you enjoy reading a comic series then go right on buying and reading that comic, no matter what the sales figures say. ** Two asterisks after a given month in the average charts mean that one or more periodical release did not make the Top 300 chart in that month. In those cases, it's assumed that said releases sold as many units as the No. 300 comic on the chart for that month for the purposes of the chart, although its actual sales are likely to be less than that. Opinions expressed in this column are mine alone, and do not necessarily reflect those of my employer; The National Brotherhood of Skiers; or my former neighbor's dog Miles. The author of this column does weekly snapshots of Amazon comic sales charts at http://yetanothercomicsblog.blogspot.com/ and tweets about comics and related subjects on Twitter at @davereadscomics (PM me there is you need to contact me). As always, we welcome your comments and corrections below. Please try to keep things civilized. This article was originally published November 6, 2018 on Yet Another Comics Blog.